Chocolate and wine are perhaps the most evocative legal substances on Earth. Combining them makes for a stellar cruise theme brought to you by the one of the most qualified and charismatic couples in barging, Captain Jason Ashcroft and Chef Dawn Coles. Chef Dawn is a graduate of the prestigious Concord Hotel and Restaurant Management Scheme in the UK, with a personal passion for French cuisine. Guests are welcome to visit her in the galley for informational cooking demonstrations as she crafts gourmet meals using locally-sourced meats and market fresh produce. Captain Jason earned his degree in hospitality from the renowned Ecole du Hotelier on the shores of Lac Leman. In addition to serving as the Captain and Tour Guide aboard Saroche, Jason is also an accomplished Chef and avid wine enthusiast. Aligned with Dawn and Jason’s sophisticated palettes, excursions introduce guests to many local attractions, among them an indulgent exploration into the aforementioned pleasures of chocolate and wine. Guests enjoy special samplings at Cote d’Or vineyards both large and small, while a tasting at a boutique chocolatier appeals to, well, everybody. Cabins and bathrooms are brand new, recently renovated in an Art Deco-inspired style. When not socializing in the salon, guests can relax on the spacious deck, or explore the countryside’s greenery and scenery by bicycle or on foot. A Savory Lunch Aboard Saroche and Quiche Lorraine! In the afternoon, you will be met by a crew member of the Saroche at the designated meeting point. 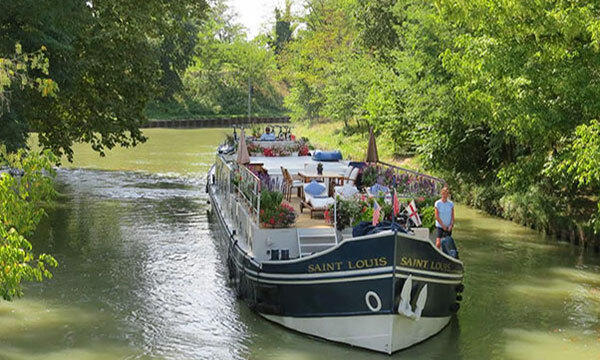 From here, relax as you are chauffeured to the barge, moored in Escommes. A traditional champagne welcome and introduction to the crew awaits you, before your first gourmet dinner aboard. 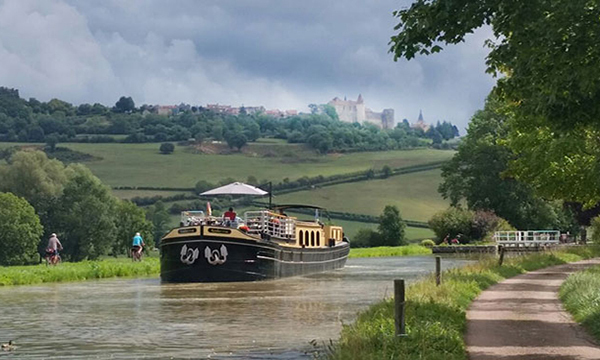 A morning cruise is completed at the foot of the region’s iconic castle, the beautiful Chateauneuf en Auxois. Your Tour Guide will then chauffeur you to the UNESCO World Heritage site of Abbaye de Fontenay, which was founded by St. Bernard in 1118. Fontenay allows for an exceptional glimpse of a devoutly religious life. Return to the barge where Chef Dawn welcomes guests into her open kitchen for a cooking demonstration. Drinks and dinner onboard. This morning's excursion is to the village of Chateauneuf-en-Auxois. Chateauneuf's imposing hilltop position refers to its history as a 15th century fortress. Tour the chateau, to discover architectural details and timeworn relics speaking to the deprivations and decadence so prevalent in France’s history. En route back to the barge, sample handmade delights at a boutique chocolatier! An afternoon cruise provides the perfect opportunity to explore the towpath by bicycle or on foot. Enjoy another gourmet dinner onboard. This morning, your Tour Guide escorts you to the charming town of Beaune, for a visit to the Hospice de Beaune, a preserved Medieval hospital built in the 15th century. Afterwards, browse the boutiques and galleries lining the pedestrian area, or enjoy a coffee in the lively town square. 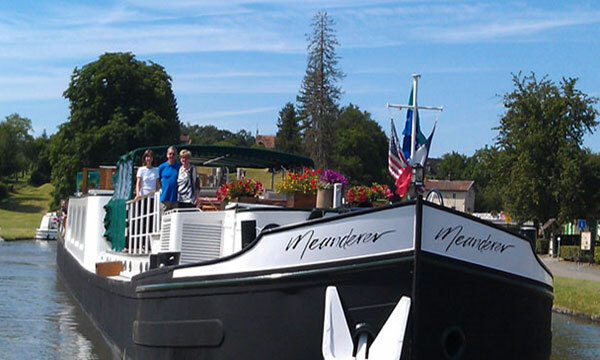 Today's luncheon is enjoyed ashore at a local auberge, followed by a private wine tasting. Your Tour Guide will chauffeur you back to Saroche for another cooking demonstration in Chef Dawn's kitchen. Cocktails and dinner await. A morning cruise begins the day, offering time for a tranquil traipse or gentle pedal on the towpath. In the afternoon, your Tour Guide takes you to Clos de Vougeot, where Cistercian monks made wine in the 12th century. A winetasting in the vineyards follows. Guests are then treated to a hunt and tasting at a local truffle farm, followed by cocktail hour ashore at Abbey de la Bussiere, a former Cistercian monastery now home to a lovely hotel. Back on the Saroche, Chef Dawn presents dinner aboard. This morning, the town of Dijon offers a pleasurable assault of the senses. "Les Halles”, the covered food market, presents colorful produce; jars of mustard are displayed in boutiques; and public spaces beckon with greenery and scenery. Shop, sip, and stroll through this charming town brimming with authentic French life. Your Tour Guide returns you to Saroche for an afternoon cruise. Relax on deck, or visit Chef Dawn in her kitchen for a final cooking lesson. A celebratory cocktail hour and Captain’s Dinner ends the evening in style.